Welcome to the Flat Earth Society, and thank you for taking the time to go through this FAQ. It was created to address the many misconceptions a Round Earther may have about the Flat Earth Theory, and to act as an easily-accessible entry point into the mainstream Flat Earth model. This page is designed to answer some of the questions that many Round Earthers raise when they first arrive. Please check this page before making your first threads in the forums, as it may contain the answers to the questions on your mind. Some of the questions here have multiple answers due to differing views of Flat Earth Theory among some of our members. 1.1 What is the Flat Earth Society? 1.2 What do all of these acronyms mean? 1.3 What evidence do you have? 1.4 Is flat earth theory connected to a religion? 1.5 People have been into space. How have they not discovered that the earth is flat? 1.6 There are many pictures on the Internet and in other media depicting the Earth as being round. Why do these not disprove the Flat Earth Theory? 2.1 What does the earth look like? How is circumnavigation possible? 2.2 How do you explain day/night cycles and seasons? 2.4 As a passenger on an aircraft, how is it I can see the curvature of the earth? 2.5 How is weather created in FET? 3.1 If the planets are round, why isn't the Earth? 3.2 Why doesn't gravity pull the earth into a spherical shape? 3.3 Objects cannot exceed the speed of light. Doesn't this mean that the Earth can't accelerate forever? What is the Flat Earth Society? 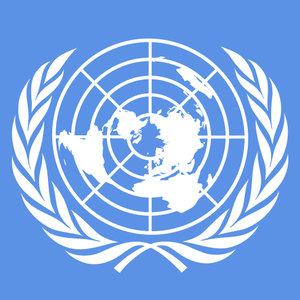 The United Nations emblem closely resembles the Flat Earth map. The Flat Earth Society is a group actively promoting the Flat Earth Movement worldwide. Descending from Samuel Shenton's International Flat Earth Research Society, and the Universal Zetetic Society before it, we continue the age-old tradition of questioning the Round Earth doctrine and challenging authorities. Acknowledging the link between various unconventional beliefs, the Society also occasionally engages in other unconventional debates, striving to provide a voice for all free thinkers and Zeteticists. What do all of these acronyms mean? Here is a link to flat earth Terminology! The evidence for a flat earth is derived from many different facets of science and philosophy. The simplest is by relying on ones own senses to discern the true nature of the world around us. The world looks flat, the bottoms of clouds are flat, the movement of the Sun; these are all examples of your senses telling you that we do not live on a spherical heliocentric world. This is using what's called an empirical approach, or an approach that relies on information from your senses. Alternatively, when using Descartes' method of Cartesian doubt to skeptically view the world around us, one quickly finds that the notion of a spherical world is the theory which has the burden of proof and not flat earth theory. Perhaps the best example of flat earth proof is the Bedford Level Experiment. In short, this was an experiment performed many times on a six-mile stretch of water that proved the surface of the water to be flat. It did not conform to the curvature of the earth that round earth proponents teach. Many other experiments demonstrating the lack of curvature in the earth may be found in Earth Not a Globe by Samuel Rowbotham, as well as in the Experimental Evidence section of this Wiki. Is flat earth theory connected to a religion? Flat earth theory is neither officially nor unofficially associated with any religion. Throughout the ages various religious institutions have championed a flat earth model for the world. Unfortunately this leaves us with the vestigial thought that flat earth theory and religions are symbiotic. They are not, even though many religions today, both mainstream and otherwise, still teach its followers that the world is flat. While they are not incorrect, believing in a flat earth isn't contingent upon believing in a deity or being a part of any religion. People have been into space. How have they not discovered that the earth is flat? The most commonly accepted explanation of this is that the space agencies of the world are involved in a conspiracy faking space travel and exploration. This likely began during the Cold War's 'Space Race', in which the USSR and USA were obsessed with beating each other into space to the point that each faked their accomplishments in an attempt to keep pace with the other's supposed achievements. Since the end of the Cold War, however, the conspiracy is most likely motivated by greed rather than political gains, and using only some of their funding to continue to fake space travel saves a lot of money to embezzle for themselves. In light of the above, please note that we are not suggesting that space agencies are aware that the earth is flat and actively covering the fact up. They depict the earth as being round simply because that is what they expect it to be. There are many pictures on the Internet and in other media depicting the Earth as being round. Why do these not disprove the Flat Earth Theory? In general, we at the Flat Earth Society do not lend much credibility to photographic evidence. It is too easily manipulated and altered. Many of the videos posted here to "prove a round earth" by showing curvature will show no curvature or even concave curvature at parts. The sources are so inaccurate it's difficult to build an argument on them in either case. Furthermore, barrel distortion and other quirks of modern cameras will cause a picture to distort in ways which may not be immediately obvious or apparent, especially without references within the picture. Photographs are also prone to distortion when taken through the bent glass of a pressurized cabin as well as atmospheric conditions on the outside. With this litany of problems, it's easy to see why photographic evidence is not to be trusted. It's also worth noting that if a person were to look down at the earth from high above, they would expect to see a circular shape where the sun's spotlight was shining. This explains why high altitude photographs are generally curved to produce the illusion of a round horizon. What does the earth look like? How is circumnavigation possible? As seen in the diagrams above, the earth is in the form of a disk with the North Pole in the center and Antarctica as a wall around the edge. This is the generally accepted model among members of the society. In this model, circumnavigation is performed by moving in a great circle around the North Pole. The earth is surrounded on all sides by an ice wall that holds the oceans back. This ice wall is what explorers have named Antarctica. Beyond the ice wall is a topic of great interest to the Flat Earth Society. To our knowledge, no one has been very far past the ice wall and returned to tell of their journey. What we do know is that it encircles the earth and serves to hold in our oceans and helps protect us from whatever lies beyond. 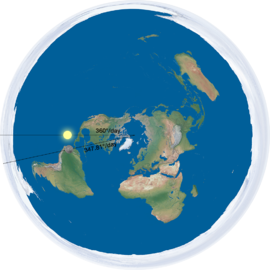 Here is picture of a proposed, but certainly not definitive, flat earth. 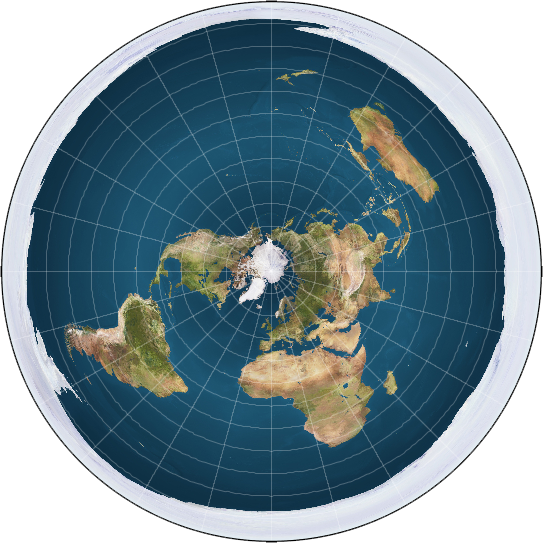 Other maps representing various Flat Earth models can be found on our Flat Earth Maps page. How do you explain day/night cycles and seasons? Day and night cycles are easily explained on a flat earth. The sun moves in circles around the North Pole. When it is over your head, it's day. When it's not, it's night. The light of the sun is confined to a limited area and its light acts like a spotlight upon the earth. 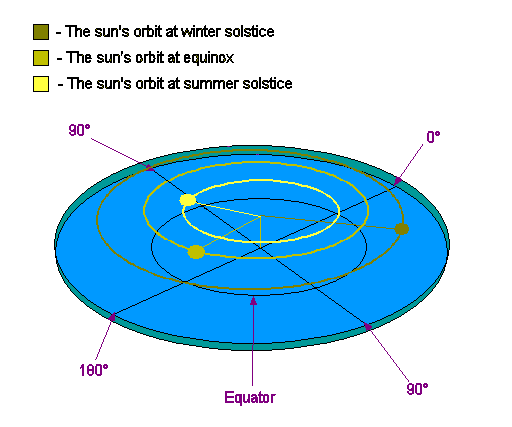 The picture below illustrates how the sun moves and also how seasons work on a flat earth. The apparent effect of the sun rising and setting is usually explained as a perspective effect. When the sun is further away from the North Pole, it's winter in the northern hemiplane (or hemisphere) and summer in the south. A more simplistic picture can be found below. While it's true that unipolar magnets can't exist, this isn't a problem for the Flat Earth. This is because ring magnets, which are shaped like (you guessed it!) a flat disk, are capable of having radial magnetization. 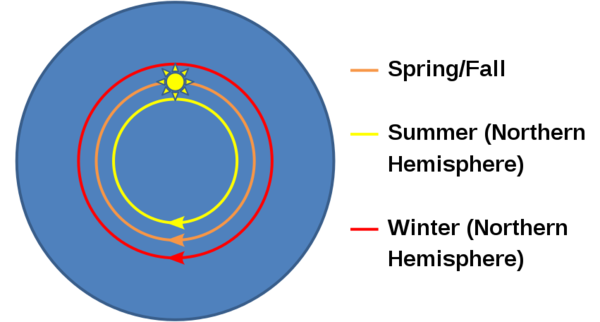 In a radial magnet, one magnetic pole is at the center and other is at all points on the edge of the magnet. A magnet like this can be found in loudspeakers, and perfectly replicates what is found on the Earth. As a passenger on an aircraft, how is it I can see the curvature of the earth? Quite simply you cannot. It is widely stated you would need to be at a height of at least 40,000 ft to get even a hint of curvature if earth were round. Commercial aircraft are not allowed to fly this high. They are only allowed to fly just under this altitude. 36,000ft might be typical. In addition, the windows on commercial aircraft are small and heavily curved. Even if they flew high enough for a person to see curvature, it would still not be visible to passengers. How is weather created in FET? Many weather patterns are actually created by the land itself. For example - rain shadow. Rain shadow is where somewhere on the eastern side of a mountain range (because weather/clouds travel from the west generally) is deprived of rain not just once, but nearly all the time. This is because the clouds are forced upwards by the mountains blocking their path and become cooler and condense, meaning water droplets form and it rains on/before the mountains thereby not raining on the leeward side. Other weather patterns are created by geographic position like the tropics being humid - they are surrounded by water which is constantly warmed and evaporated. If the planets are round, why isn't the Earth? The 2007 retrograde of Mars. Retrograde motion occurs from the fact that the planets are revolving around the sun while the sun itself moves around the hub of the earth. 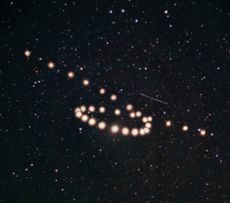 This particular path the planets take makes it appear as if several of them make a loop along their journeys across the night sky. Planets (from Ancient Greek ἀστὴρ πλανήτης [astēr planētēs, "wandering star"], or just πλανήτης [planḗtēs, "wanderer"]) are orbiting astronomical objects. The Earth is not a planet by definition, as it sits at the center of our solar system above which the planets and the Sun revolve. The earths uniqueness, fundamental differences and centrality makes any comparison to other nearby celestial bodies insufficient - Like comparing basketballs to the court on which they bounce. Why doesn't gravity pull the earth into a spherical shape? The earth isn't pulled into a sphere because the force known as gravity exists in a greatly diminished form compared to what is commonly taught. The earth is constantly accelerating up at a rate of 32 feet per second squared (or 9.8 meters per second squared). This constant acceleration causes what you think of as gravity. Imagine sitting in a car that never stops speeding up. You will be forever pushed into your seat. The earth works much the same way. It is constantly accelerating upwards being pushed by a universal accelerator (UA) known as dark energy or aetheric wind. There are also other theories of flat earth thought that maintain that the earth sits on an infinite plane, with the sun moving overhead. Gravity works much like it does in a round-earth model, and the earth will never form into a sphere because the plane is endless. Objects cannot exceed the speed of light. Doesn't this mean that the Earth can't accelerate forever? Due to special relativity, this is not the case. At this point, many readers will question the validity of any answer which uses advanced, intimidating-sounding physics terms to explain a position. However, it is true. The relevant equation is v/c = tanh (at/c). One will find that in this equation, tanh(at/c) can never exceed or equal 1. This means that velocity can never reach the speed of light, regardless of how long one accelerates for and the rate of the acceleration. This page was last modified on 22 March 2019, at 15:28.